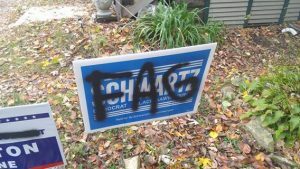 Iowan Chris Schwartz has alleged that vandalism found at his property on Thursday is the work of citizens influenced by “hateful rhetoric” of a Christian patriot group who vocally opposes his run for a seat on the Black Hawk County Board of Supervisors. ISO stands for the International Socialist Organization, a Trotskyist, communist group. ISO is notorious for supporting the Palestinian and Arab causes in the Middle East and led many militant protests against America’s war effort in Iraq. Additionally, virtually all leaders of the now-defunct CAN were members of ISO. In line with ISO policy, Schwartz was involved in anti-Israel activities and led an anti-Iraq war rally in support of Cindy Sheehan, who became a vocal critic of the Iraq war after her son was killed during his service in Iraq. ISO’s website, SocialistWorker.org has quoted Chris Schwartz here and here.